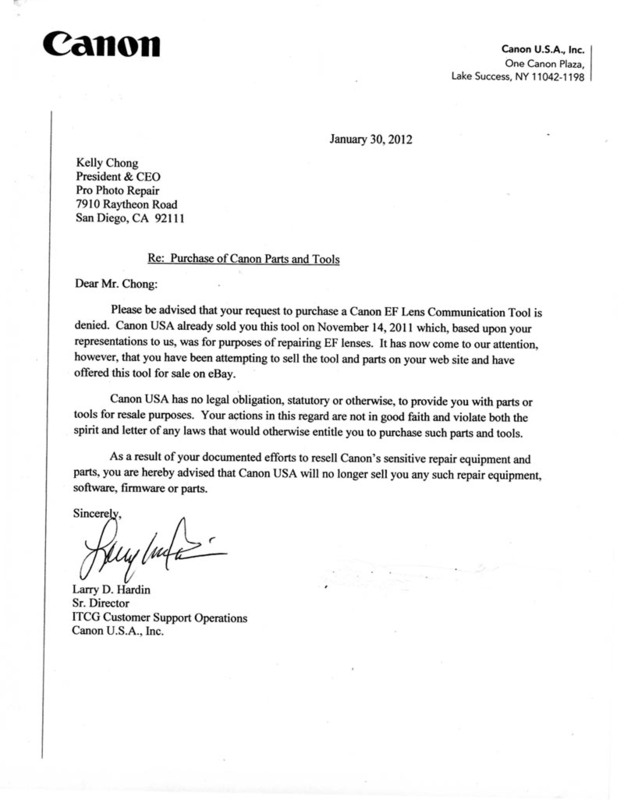 So why has Larry Hardin at Canon, USA Inc. decided to end their relationship with Pro Camera Repair? When we originally inquired about this part, there was no exclusive obligation or written contract for us to not distribute this tool. We did not acquire the tool using any form of deception or with any malicious intent. We wanted to provide other service shops with an option to service the newer Canon EF lenses and provide a new product to our clients. We did not violate any "good faith" or "the spirit and letter of any laws" as Larry Hardin at Canon USA, Inc. claims. We can provide our original communication inquiring about the tools and adjustment software. Why is Canon so objected to having this lens tool available for third independent party service shops? We provide an alternative option to Canon Service Center. By providing independent party service shops the necessary software and adjustment tools we are able to provide other facilities to services on DSLRs, Point and shoot digital cameras, camcorders, lenses and other photographic equipment providing consumers and alternative option to have their Canon equipment serviced. Why should software and adjustment tools that exist not be available to independent repair shops to provide alternative options for the consumer? Is this legal? Pro Camera Repair will not be able to operate for very long without having any access to parts to service Canon cameras. They have refused to deal with us. This is so disappointing for me. The camera repair industry has almost disappeared in the past 10 years. I've seen the direct effects of globalization and big business control. Can big business push small businesses around like this? Can they decide to no longer supply us any products [parts] that are critical to the services and repairs we perform? We are a small business that employs around 8 hard-working individuals. Without access to any Canon support, we are not sure how long we will be able to keep our business running. "Kyosei" is Canon's Corporate philosophy. Their definition is: "All people, regardless of race, religion or culture, harmoniously living and working together into the future." Small repair shops, like us, have been supporting Canon cameras for decades. We continue to service their older SLRs and other equipment they don't provide services to. Canon's hostile actions towards us deeply sadden us. General Manager of Pro Camera Repair, Inc.